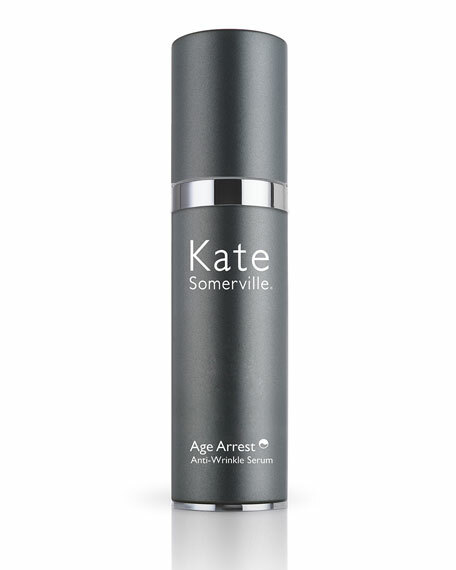 Kate Somerville Age Arrest Anti-Wrinkle Serum, 1.0 oz. Kate SomervilleAge Arrest Anti-Wrinkle Serum, 1.0 oz. Rescue skin from the signs of aging and help protect against pollution with this advanced renewing serum. It is powered by revolutionary Telo-5 Technology, based on Nobel Prize*-winning science on the youthful benefits of prolonging the life of telomeres. As we age, skin cell telomeres shorten and critical youth information is lost. Over time, this leads to wrinkles, dryness and sagging skin. Telo-5 Technology is designed to combat the comprehensive signs of aging and deliver a firmer, younger-looking complexion. Packed with age-defying Actives and protective Antioxidants, this luxuriously lightweight serum is made with powerful Tetrapeptides to help boost the production of collagen and elastin. Marine Extracts, such as Sea Mayweed and Laminaria Kelp, help diminish the appearance of fine lines and wrinkles, while Sea Whip Extract and Algae Plasma helps soothe sensitive skin. It's also formulated with Thiotaine, a powerful pollution solution that helps protect against environmental aggressors. Helps protect skin against pollution.